Young children, ages 3 to 6 years, are invited to enjoy a variety of stories, action rhymes and/or songs during this 30 minute program. 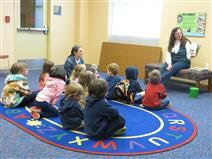 Story times provide a foundation for building a lifelong love of books and reading. After each program, children and their caregivers are invited to stay for a fun craft activity. Please call the Children’s Department at 817-427-6818 for more information. This week's theme: Bats.